CSIR statistician Paul Mokilane won the Best Track Paper Award at the 2018 First African International Conference for Industrial Engineering and Operations Management, held in Pretoria, recently. Paul's paper titled: Long-term electricity demand forecasting using a generalised additive mixed quantile averaging (GAMMQV) model forms part of his PhD research and was presented in the Energy Track of the conference. 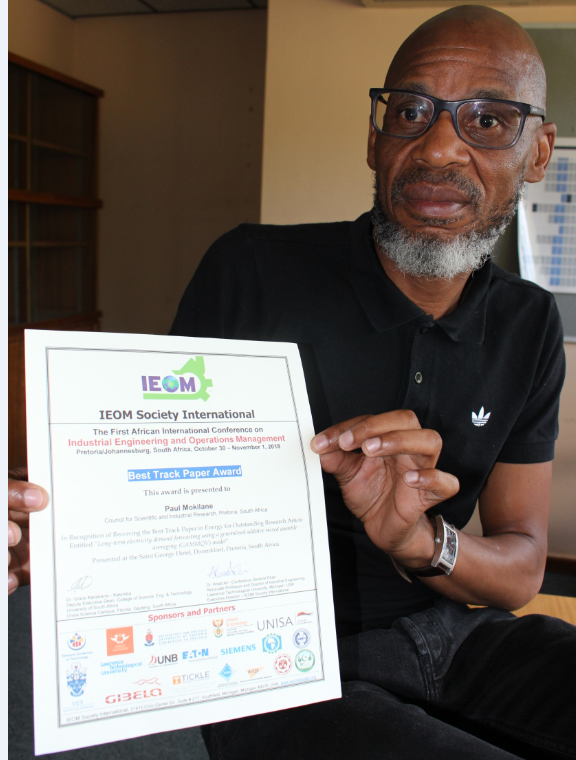 CSIR statistician Paul Mokilane won the Best Track Paper Award at the 2018 First African International Conference for Industrial Engineering and Operations Management, held in Pretoria, recently. Paul's paper titled: Long-term electricity demand forecasting using a generalised additive mixed quantile averaging (GAMMQV) model forms part of his PhD research and was presented in the Energy Track of the conference. The paper investigates the application of a GAMMQV model to forecast the long-term hourly demand for electricity in South Africa, which enables the variabilities in the forecasts to be evaluated and uncertainties around the point forecasts to be quantified. "Our objective is to forecast the long-term demand for electricity in South Africa in the presence of uncertainties, hence we used the probabilistic instead of the point forecasting approach to achieve this end," says Paul. Long-term forecasts are used for capital planning as they assist to determine whether the current generation infrastructure will still generate enough electricity to meet future demand for electricity. Paul adds: "For planning purposes, the quantification of uncertainties around the forecasts is important as an overestimation of long-term electricity demand will result in substantial wasted investment in the construction of excess power facilities, while an underestimation of demand will result in insufficient generation and an unmet future demand." Paul further explains: "This is very important in that in point forecasting uncertainties around the forecasts are not quantifiable." According to Paul, the model can also be used to forecast the demand for electricity in the medium term. Medium-term forecasts are used for maintenance scheduling to help ensure that the demand for electricity is met during a maintenance period. In his paper, Paul reports on the validation of his GAMMQV model which showed that the demand forecasts at the 50th percentile of the demand distribution closely matched the actual hourly demands over a specific reference period. In general, the forecasts pick up on recent downward shifts of hourly demand and peak daily demands and the model forecasts a continuation in the shift towards a lower demand in 2023. Although the model was not designed to test the underlying causes of shifts in demand patterns, declining demand could potentially be attributed to the growing use of renewable sources of electricity, the sluggish economic growth, the steep increases in electricity tariffs in the recent months and the market penetration of energy efficient appliances, among others. The paper is co-authored with his industry supervisor Prof. Pravesh Debba, Manager for CSIR Spatial Planning and Systems; Prof. V.S.S. Yadavalli from the University of Pretoria and Dr Caston Sigauke from the University of Venda.